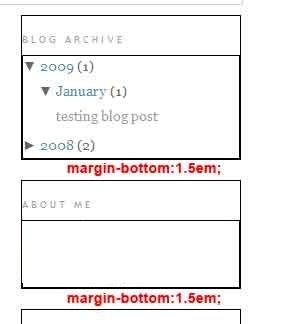 In this article I will show you how to adjust the margins and paddings of the sidebar widgets and posts in blogger blogs to make it look neat and can maximize your blog space. You may look for a blogger template with rightly placed sidebar widgets for you to use, but this may take a lot of time. Instead I will show you a technique that you can apply and I am sure you will love doing this often. You may find one template like the one that I have mentioned, but you may not be happy with its other parts. So, one way to solve this is to tweak the sidebar widget distance yourself. And by tweaking, you will be able to customize your blog widgets with the right size, just enough to be put into your blog. Always download a backup copy of your template before doing anything or use a test blog as i can not be held responsible if you mess your blog up.